Take advantage of the warmer weather by taking your workout outside and going for a run. Running is a great way to get fit and have fun. 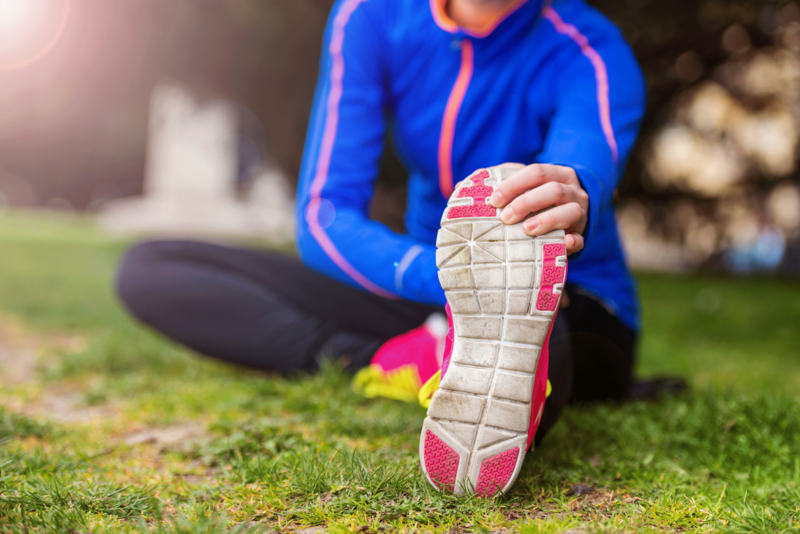 Stretches are an essential part of your running routine to avoid injuries. Stretch your arms in front of you and place both hands on a sturdy object. Stand with feet comfortably apart with toes pointing towards the wall. Put one leg back about 12 inches from the other, keeping the knee straight and your foot flat on the ground. Bend the knee of the front leg so your hips move forward and lean into your hands. You should feel this stretch along the back of the leg below the knee. Adopt the same position as for the upper calf stretch. Shift the foot of your back leg forward until the toes are just behind the heel of the front leg. Keep both heels on the ground with toes pointing forward. Lower your hips by bending both knees. You should feel this stretch through the back of the ankle. Stand near a wall, bench or a post and put one hand on it for balance. Grasp your ankle or foot with the other hand. Keep your upper body straight and pull your heel up towards your buttock. The knee of the leg you are bending should point towards the ground. If you are able to touch your buttock with the heel of the foot, gently extend the hip by moving the knee backwards. You should feel this stretch through the front of the leg above the knee. Place one foot up on a low surface about knee high with your hands on the thigh. Keep the knee of this leg straight with the toes pointing forward. Bend forward from the hips—not the waist. 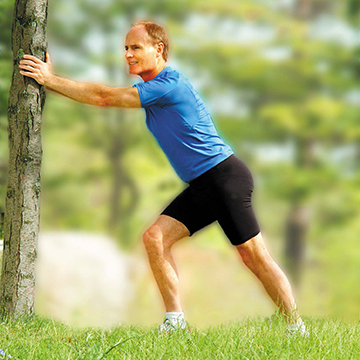 Keep your lower back flat by bringing your chest towards your knee rather than your head. You should feel this stretch along the back of the front leg above the knee. From the back thigh stretch position, bend your front knee so that foot is now on the edge of the surface. Hands on hips, lean slightly forward over the bent leg. Keep the leg you are standing on straight. You should feel this stretch in the back of the hips and buttocks. If you have other questions or concerns, talk to your local chiropractor about how to improve your running and prevent and manage injuries.